(Left): Funded in part from the Massachusetts Renewable Energy Trust, this 100kW solar PV array was installed at the new WGBH public television offices in Boston (Photo courtesy of Solar Design Associates). (Right) SOLARA is the first development to be delivered under the California Energy Commission's Zero Energy New Homes program. This multi-family affordable housing complex is located in Poway, CA. The total 141kW PV system, which is located on the roof of each building and most of the carports, will function as 63 separate systems serving 56 families. Most of the cost of the PV system and energy efficiency upgrades to the project were covered by state and federal programs available to affordable housing developers (Photo courtesy of Community HousingWorks, Owner/Developer). 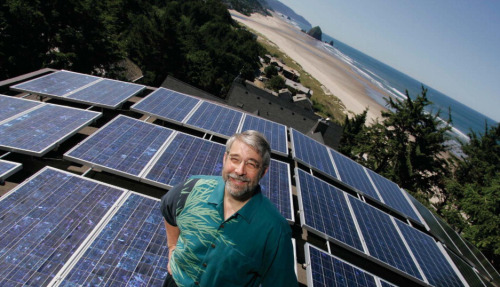 Energy Trust of Oregon provided funding support for this 5900 watt system on the Oregon Coast. While solar photovoltaic electricity (PV) markets are growing in the USA, they are still far from robust. The total capacity of solar PV power generation in the USA remains quite modest, though increasing numbers of solar PV systems are being installed in various States. This under-capacity is especially striking when compared to Japan and Germany, which have established national programmes and policies to support solar PV markets aggressively. However, there is good news: across the USA the States are taking a growing leadership role in the support of solar energy technologies, recognising the technology's environmental and economic benefits. In fact, the 2007 US growth rate of 45% for PV installations was among the highest in the world, due in large part to support from State solar programmes. For example, the California Solar Initiative has an ambitious goal of installing 3000 MW of new grid-connected solar PV in 10 years. New Jersey's goal is to install 2300 MW of PV by 2021. And more than 11 States have adopted renewable portfolio standards (RPS) with specific and ambitious targets for solar generation. To examine these State-based solar efforts, the Clean Energy Group recently developed a report, 'Mainstreaming Solar Electricity: Strategies for States to Build Local Markets'. The report provides a blueprint for strategies that States can pursue to effectively mainstream solar electricity, based on the real-time experience and innovation of the major State solar programmes. The major obstacles to market penetration of solar technology are on the 'buyer' side of the equation. That is, potential purchasers often find it difficult to justify the significant first costs of a solar PV system, and are further hindered by restrictive codes and regulations. In view of this cost barrier, States must ensure that they create solar support programmes that seek to build vibrant local markets while removing market barriers. Solar PV system costs include hardware costs (modules and inverters), but also non-hardware costs including marketing, sales, local transportation, hiring and training, insurance, permits, installation, and inspection. Hardware costs are generally set in the worldwide market, driven by technological innovation, and heavily driven by factors out of the control of State programmes. However, non-hardware costs, equal to 50% or more of the total price of a system, are subject to the influence of State policies and programmes. So as State policy can have a major impact on the overall system price, it is fortunate that most energy policy is set at the State level. It is critical that the States take action to remove the regulatory hurdles that stand in the way of wide-scale deployment of solar energy, and provide the incentives needed to spur demand and build local markets. Sustained, long-term solar incentive programmes at the State level will enable more significant PV cost reductions. In fact, support for building a mature solar PV market is the most direct way for States to reduce non-module costs because such markets will attract and encourage suppliers to create an efficient delivery infrastructure. Experience in Japan suggests that deeper cost reductions are possible with a more sustained policy effort. Seeking to replicate the Japanese success in the USA, the California Solar Initiative (CSI) is a good example of a State programme designed to create a mature market. The CSI is a 10-year, US$3.3 billion programme, with rebate levels reduced each year by approximately 10%. This approach allows the State to set the maximum programme cost, and, if the initial subsidy is too high, expect payment levels to self-correct. A gradually declining level of incentives not only suits an industry with high cost-reduction potential and the potential for rapid growth but improves on State rebate programmes. Such State programmes are often subject to arbitrary cessation and annual budget fights. Moreover, whatever the amount of State funds made available for solar incentives, it is critical for States to commit and release these resources in a way that ensures long-term continuity of the incentive programme — for periods of five to 10 years. Long-term support allows a local solar technology infrastructure to develop and stabilise, without boom and bust cycles. State policy makers should consider publicly committing to an installed MW solar capacity goal as the basis for future policy and programme actions. This will create clear market expectations and strengthen investor confidence. It will also make it easier to predict future budgeting and help ensure continuity of programme design and deployment. 10 years - sustained growth without subsidies. 1. State funding - Performance-based incentives only. 2. Programme guidelines - Solar PV system warranties must be transferable to future owners. 3. Financing - Gov. & non-profits only, cost effeciveness applicable. No state-sponsored best practices promotion or information sharing. Time of use rates are in place to monetise special value of PV during peak periods; feed in tariffs available on limited basis. PV has been earmarked for schools but higher incentive funding has been used up. Utilities train their own inspectors. Add'l relationships with financial institutions, builders associations ('new solar homes partnership'). Encourage comparison shopping to reduce prices. California — 3000 MW by 2017; New Jersey — 2300 MW by 2021; and Maryland — 1500 MW by 2022. The majority of States have established Renewable Portfolio Standards (RPS) that require utilities to supply a specified percentage of electricity from renewable resources. An RPS represents an important tool to expand State solar markets if designed with differential support for solar technologies. However, due to cost and solicitation barriers, a traditional RPS — in which all eligible renewable resources compete — supports least-cost projects such as wind and landfill gas, and is unlikely to provide adequate support for smaller-scale solar distributed energy. Therefore, in recent years, States increasingly provide differential support for solar within an RPS program in recognition of the special benefits of solar installations. At least 11 States have now established a solar share or set-aside — a requirement that some portion of the RPS come from solar resources. This mechanism strengthens solar markets by allowing solar technologies to compete against less costly renewable technologies. New Jersey has been most aggressive in its use of a solar set-aside, with 2% of its RPS target required to be delivered from solar PV systems, requiring 2300 MW AC of solar by 2021. New Jersey's solar development targets are the largest in the country on a per capita basis and are now driving the State's high growth in PV installations. Interconnection and net metering are two key State-controlled policies that enable States to get serious about promoting solar distributed generation. Solar PV customers must be able to connect to the utility grid without undue delay and expense. And net metering ensures that consumers with solar PV systems can meet their energy needs while crediting customers for all the solar energy they generate. 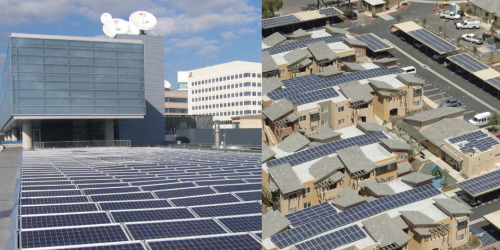 Therefore, well-crafted, simplified interconnection standards and net metering promote the broader deployment of customer-sited solar systems. Once again, New Jersey is in the lead, often singled out as the best in the country among States with net metering rules and interconnection standards. As a result, New Jersey reports the highest rate of net metering enrolment in the USA. State solar programmes should simplify programme requirements and paperwork to make them easy to understand and use. States should employ electronic applications and tracking systems wherever possible. States should also strive for efficient programme administration and rapid funding decisions and notifications. A lack of long-term project financing options impedes the sale of solar PV systems. While consumer loans, home equity loans, and home improvement loans can be used to finance solar PV installations over time, the paybacks on solar PV systems generally fall well outside of the practical loan term for such instruments. This has led States to explore special solar loan programmes that target homeowners, featuring low interest rates and/or no hassle application requirements. More and more States are developing long-term loan programmes targeted at renewable energy to reduce monthly payment levels. These loans should have a low interest rate, below that on a 30-year mortgage for residential loans. Key components of these programmes are low hassle and administrative fees. Application forms, paperwork, and fees should be kept to a minimum, with a quick turn-around for loan approval. These finance instruments should avoid debt service coverage requirements or lien on property (other than the solar system itself being financed). Tax incentives have proven effective in encouraging private investment in solar energy, as evidenced by the effect of the Federal Investment Tax Credit (ITC). Residential and commercial decisions to invest in solar PV can be directly influenced by consumer-focused investment tax incentives, as these incentives reduce the effective up-front cost of the systems and increase demand for the technology. Several States have established investment tax incentives for customer-sited renewable energy applications, including Arizona, California, Massachusetts, New York, Ohio, and Oregon. Oregon's programme is particularly comprehensive and effective as it includes both a residential and a business energy tax credit. Formal goal: - 2300 MW by 2020 (2.12% of retail sales). 10 years - 1000 MW installed, phase out of RECs being discussed. Capacity-based incentives; in-state manufactured equipment adder. 2. Programme guidelines - warranties required to be transferable to future system owners. 3. Financing - long term commercial financing for solar PV retrofits. Promoting best practices and training is planned. No time of use rates are in place. All PV excempt from sales tax. Solar PV system installation is encouraged and supported in public schools and rebates higher for public sector. Code official training offered with IREC, also builder and architect training. Additional relationships with architectural societies, electrical contractor assns, environmental organisations, ratepayer advocates. Limit residential applications to 5 kW unless energy efficient. Third party ownership is a solar PV business model that is emerging as a powerful approach, since the third party has access to low cost financing, greater ability to take on and mitigate technical risks, and can make use of all Government incentives and tax advantages. This model also reduces hassle and complexity for the end-user and provides better access to financing. California and New Jersey, among other States, allow this ownership structure and business model to participate in their solar incentive programmes. Other States may want to explore how they can encourage expansion of this business model and other innovative business models, such as utility ownership of solar PV systems. A State's sales tax and property tax policies are both powerful and highly flexible tools that can be used to encourage or discourage solar technologies - either limiting a PV system's first and lifecycle costs or further escalating those costs. As solar energy systems are capital intensive, sales taxes on equipment and property taxes can be significant. Many States have exempted all solar PV systems from State and local sales taxes. If sales tax exemptions are not possible under State law, States can restrict the tax basis for PV systems to the cost of equipment only. Many States also exempt all PV systems from property taxes. Minnesota provides an example of effective tax policy that supports solar PV deployment. The State offers both property and sales tax exemptions for all PV systems. States should seek to encourage high-value or niche applications for which solar PV technology is particularly well-suited and more cost effective: public buildings, schools, and new home construction. Such solar applications help to educate officials and the public about the benefits of the technology, promote high visibility for the technology, and offer economies of scale, thus reducing solar costs due to the larger size of most public buildings. States are increasingly establishing policies that require that solar PV system installation be considered and evaluated for all major public building construction. States can demonstrate their confidence in solar PV technology and strengthen the PV market by adopting policies that mandate the inclusion of PV systems as appropriate, given site conditions for all publicly-funding building projects that involve major renovations or new construction using State funds. The additional expense for a solar PV system installation will often be very small in the context of a project's total design and construction cost. Further, because these buildings are likely to be occupied and used for a public purpose for the life of the system, a life cycle analysis of costs and savings should justify the additional expense. A good example is Oregon's recent legislation, enacted in 2007, that requires installation of solar energy systems on public buildings in most circumstances. The law provides that all public building projects should include solar technologies in an amount determined by the total building cost. The solar technology investment must amount to at least 1.5% of the total contract price. The policy also applies to major renovation projects if the cost of the renovation exceeds 50% of the total value of the building. Many States also require and provide support for the installation of renewable energy systems and solar PV as part of major public school construction projects. “Solar on Schools” provides high demonstration value and an important teaching tool that offers students the opportunity to see first hand how renewable energy works. New York State has been a leader in targeting installation of solar PV systems in public schools through the NY State Energy & Research Development Authority's School Power Naturally programme. Connecticut also has a noteworthy High Performance Schools Programme that aims to change the way in which Connecticut's schools are designed and built. It also seeks to encourage towns to include energy efficiency features and clean distributed energy generation as standard components. The growing demand for solar PV systems requires a specialised, qualified workforce. An ample supply of installers and installation companies creates competition for customers that can help drive quality installation and services up and prices down. Many States offer training to installers. Training targets in most States also include local code officials and inspectors. Some States also target builders and architects. New York has been a leader in the integration of PV courses and certifications into school programs at the secondary school level and in its State colleges. NYSERDA provides funding to New York technical schools, colleges, and continuing education programmes to develop and implement nationally accredited training programs and facilities to train solar PV installers. Funding is being provided for accreditation at three levels: instructors, training organisations or institutions, and continuing education providers. To date, NYSERDA has helped to develop ten nationally accredited training centre and continuing education programmes across the State. Long-term Government leadership and commitment to solar technology deployment are needed the market is to grow, and to enable consumers, businesses, and industry to get the benefits of greater use of PV and other solar technologies. It is also important to recognise that no single State policy or programme can create a self-sufficient solar market in isolation. Instead, States should consider employing a portfolio of policies and strategies to drive solar markets, and embrace innovative approaches and lessons learned from leading solar States like California, New Jersey, NewYork, Colorado, and Massachusetts.